Bon Jovi commences the New Zealand leg of THE CIRCLE world tour in Wellington this Saturday 4 December followed by an Auckland show at Vector Arena on Sunday 5 December. THE CIRCLE world tour sees the band performing a staggering 135 shows in 30 countries across the globe. The brand new stadium production coming to New Zealand is one of the biggest sets to be seen in this country. Powered by 800,000 watts of sound and containing close to 5,000 kilograms of high definition video technology, the production features a 400 square metre video screen, the largest of its kind in the world today which was built with brand new state of the art technology. The production gear which weighs more than 77,200 kilograms will be transported to New Zealand in a 747 jet plane. 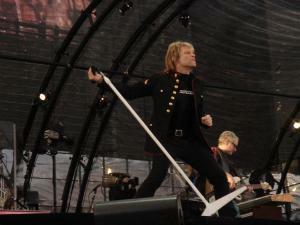 Bon Jovi have racked up a stellar resume of career highlights and accomplishments worthy of acclaim and pride. That's reason enough to release a greatest hits collection including some brand new tracks. This collection of hits provides a powerful reassertion of Bon Jovi's commitment to the hard-hitting rock & roll that has been the band's indelible signature since it began more than 26 years ago. Having sold more than 120 million albums and performed more than 2,600 concerts in over 50 countries for more than 34 million fans, Bon Jovi have established themselves as one of the world's most dynamic live rock acts.